Activities: Legendary Lentil Cook-Off, lentil pancake breakfast, live music, food court, beer and wine gardens, parade and fun run. Growing up, we ate lentils galore. Packed with protein, fiber and folate, they’re hearty, stick-to-your-ribs ingredients, popularized in America by 1971’s “Diet for a Small Planet.” Mom – well-meaning, health-conscious and thrifty – tucked lentils into almost every soup or stew throughout the 1970s, ’80s and beyond. Mentioning how good they were made me – as a kid – want to eat them even less. I still picture the legumes by the bowlful – mushy, watery and brown, with onions and a few carrot discs for color. I bought them anyway as a young adult, keeping them on hand as an affordable and versatile staple. Maybe I was just used to having them on the shelf. For years, I kept them as an emergency food. Now, I’m not really the veggie burger type. When I used lentils early on in my own cooking, it was mainly how Mom did – in comforting soups or stews. But they still weren’t my favorite. Then I moved to Eastern Washington – lentil country – and discovered I love their rich, earthy flavor in salads, particularly paired with peppery greens, a colorful vegetable like beets or butternut squash, and maybe a little chevre. Lentils add a chewy nuttiness to spicy greens and mild grains – from arugula to quinoa. While they’re still often associated with so-called “hippie food” and those warming winter soups and stews, lentils can be used in recipes to make things you might not expect – from chocolate cake to breakfast pancakes. And – like Mom said – they’re good for you. These days that knowledge makes me want to consume them. And it seems like I’m in just the right place. The Palouse – the self-proclaimed “Lentil Capital of the World” – pumps out more than 1 million pounds of lentils each year, according to the U.S. Department of Agriculture. 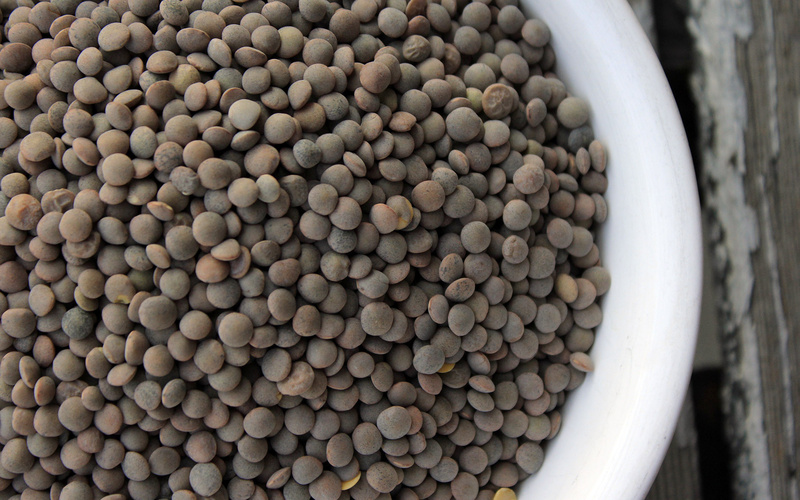 However, most of the lentils grown here are shipped to Spain, Mexico, Italy, India and other places where they are more widely consumed. So here are a few recipes that put the spotlight on the little legumes – just in time for this weekend’s National Lentil Festival. Bring 1 cup water to a boil in small saucepan. Add lentils, cover and simmer over low heat until lentils are soft but still hold their shape, about 15 minutes. Drain lentils, transfer to a bowl and cool. Lightly coat eight 4-ounce ramekins with softened butter and sprinkle with sugar, shaking out excess. Place on a baking sheet. Break chocolate bar into 16 equal pieces. Melt chocolate chips in a saucepan over low heat or in a double boiler; set aside. Whisk eggs until lightly beaten. Add sugar, butter, hazelnuts, flour, orange zest, and salt and mix until smooth. Stir in melted chocolate and lentils. Spoon batter into prepared ramekins. Bake until cakes are set and tops are puffy and slightly cracked, about 15 to 20 minutes. Remove from oven, then immediately press two chocolate pieces vertically into the center of each cake. Cool 5 to 10 minutes, then run a knife between the cake and ramekin edge and carefully remove cake; transfer to a serving plate. Serve with a scoop of ice cream. Rinse lentils thoroughly. In a pot, add the lentils, water and salt. Bring to a boil. Reduce to a simmer for 20 minutes, or until all lentils are tender but still hold their shape. Gently rinse in cold water to remove excess starch and reduce the temperature. In a large mixing bowl, add all ingredients except for the lentils. Mix well, then add the lentils at the end and gently toss together. In a 2-quart saucepan on medium heat, saute oil, shallots and salt until fragrant. Add ginger and toast until fragrant, about 3 minutes. Add water, coconut milk and lentils. Simmer for 10 minutes, then add chopped tomatillos, cilantro and slivered chilies. Cook 10 minutes more, until lentils are tender. Puree with a stick blender and add lime zest and juice, adjusting salt as needed. Serve chilled, garnished with cilantro sprigs, sliced cucumber, serrano, lime and a drizzle of coconut milk. Variations: Add poached prawns or crushed peanuts. Garnish with bean or lentil sprouts or slivered apple, especially a tart varietal like Granny Smith. Serve with cold bean thread noodles for a more substantial meal. Preheat oven to 390 degrees. Put beets in a saucepan of water and bring to a boil, then simmer for 30 to 45 minutes, until tender. Drain well, then rub off the skin and cut into quarters. Meanwhile, cook the lentils in a pan of boiling water for 20 to 25 minutes, until tender but not slushy. Drain in a colander, hold under running water until cool, then drain again. Place the lentils in a large bowl and stir in half the dressing. Add the parsley and top with the beets and onion. Sprinkle the cheese over the top, add a twist of black pepper, and serve with the remaining dressing on the side. Combine salt and mustard in a bowl. Add the vinegar and slowly trickle in the oils, whisking until emulsified. Alternatively, put all the ingredients in a screw-top jar and shake thoroughly rather than whisk. Soak lentils in water for an hour or so. Heat the oil in a heavy ovenproof pan over medium heat and add the vegetables, garlic, thyme and bay leaf. Cook gently with lid on the pan for 5 to 10 minutes, then stir in the drained lentils. Add the red wine vinegar and simmer until all of the liquid has evaporated. Preheat oven to 325 degrees. Add the chicken stock and cover with waxed paper and foil. Bake in the preheated oven for 35 to 40 minutes, or until lentils are tender with a slight bite. Let cool. Stir in lemon juice and parsley before serving. Season to taste. Find recipes for ultimate veggie burgers, and arugula, lentil and butternut squash salad online at www.spokesman.com/ blogs/too-many-cooks/.